Paco Díaz (Palma de Mallorca, Spain) on 26 May 2009 in Architecture. Barcelona. Arquitectura Modernista. 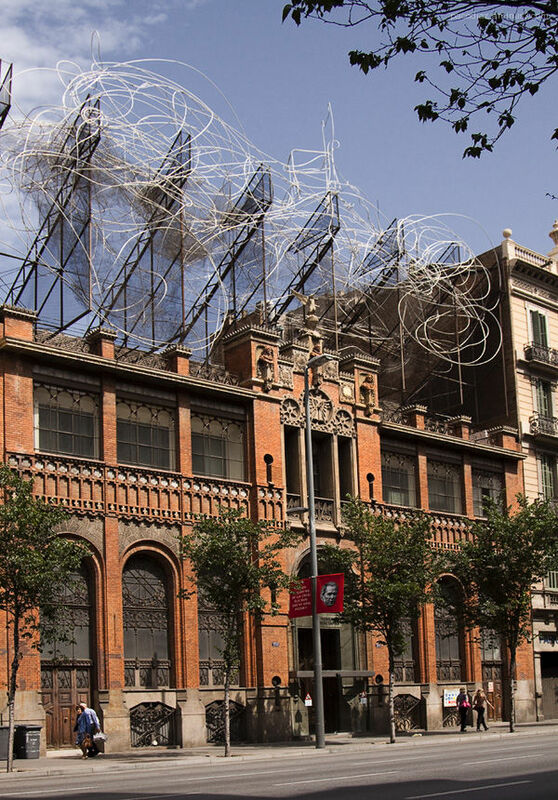 La fundación Tàpies. Edificio obra del arquitecto Lluís Domènech i Montaner. Construido entre 1881 y 1885, la fachada del edificio combina la utilización de los ladrillos con hierro. This is a great building, a work of art, beautiful details! What a very good capture, Francisco. Very nicely done! The people in front adds a lot to the feel here. Quite an incredible place!!! Nicely shot! Surmonté de la sculpture "Nuage et Chaise" ! Je connaissais (j'ai passé une semaine à Barcelone il y a 4 ans, et cette sculpture m'avait intriguée, je voyais le nuage, et pas la chaise !! Grâce à cette belle photo, je découvre la chaise !) Je dis belle photo, parce qu'elle met en valeur, à la fois l'édifice et la sculpture, ce qui n'est pas facile. Barcelone est une merveilleuse ville très variée en ambiance et en architecture. Les architectes modernistes ont rivalisé de talent là-bas. Bravo Paco. Bonito edificio y bonita foto. I have this one on my blog too Paco !! Ah Barcelona, one of my favourite cities, and what a fantastic topknot this building has. I pity the one who'll have to 'untangle' this lol too good ! C'est ce qu'on appelle "être branché !" How cool! So interesting with the wires and he interplay with the wispy clouds in the sky. Love this, beautifully shot! If that swirly part lights up, it would make a great night shot too. The building is beautiful in any case. Buena muestra del "Modernismo". Esta foto no es de archivo, tiene pocos dias, lo digo por la publicidad de las Elecciones Europeas. such a crazy looking building! love it! wow that assortment of wires is very intriguing!!! do they light up at night? i bet they would be awesome!! !